Global Entry is a program of the U.S. Customs and Border Protection service that allows pre-approved, low-risk travelers to receive expedited clearance upon arrival into the United States. As of October 2017, Global Entry was available at 54 US airports and 15 preclearance locations. More than 1.8 million people are enrolled in Global Entry and approximately 50,000 new applications for the program are filed monthly. To enroll in Global Entry, applicants must first file an application with Customs and Border Protection, and then submit to an interview and background check. The wait for an interview may be months. There is a $100 non-refundable fee for the application, even for infants and children (some credit cards reimburse this fee). During the interview, the applicant's fingerprints are captured and a digital photo is taken. Applicants are also given instructions on how to use the automated kiosk. Once an application is approved, the applicant may use the Global Entry kiosk at any participating airport for a duration of five years past one's next birthday following approval. Renewal requires an additional fee. Enrolled users must present their machine-readable passport or permanent residency card, and submit their fingerprints to establish identity. Users then complete a computerized customs declaration, and are issued a receipt instructing them to either proceed to baggage claim, or to a normal inspection booth for an interview. Enrolled users are provided with an RFID-enabled Global Entry membership card that may be used to enter the United States via expedited NEXUS lanes from Canada, or SENTRI lanes from Mexico, or at sea ports of entry. Note that citizens and permanent residents of Canada are not eligible to join Global Entry; however they can join NEXUS, whose members have all benefits of Global Entry including using Global Entry kiosks. It is possible for any type of criminal conviction to disqualify a traveler from the Global Entry program. Three to five percent of travelers who sign up for the program are rejected; in such cases, they are generally told the reason for the rejection. For example, paying a fine for having a prohibited or undeclared item at a port of entry generally will disqualify a traveler. Those whose Global Entry applications are denied have three ways to appeal: making an appointment to speak with a supervisor at a trusted traveler enrollment center, e-mailing the Trusted Traveler Ombudsman, or filing a complaint through the Department of Homeland Security's Traveler Redress Inquiry Program. CBP claims that in less than one percent of cases in which Global Entry was granted, it will be revoked. In these situations, an explanation for the revocation is not necessarily supplied. Members of Global Entry (along with members of NEXUS and SENTRI) may use TSA PreCheck on all participating airlines by entering their Customs and Border Protection ID number from their Global Entry card into their flight reservation information or into their frequent flyer account under "Known Traveler Number" (KTN). During the 1990s and early 2000s, the US Immigration and Naturalization Service operated INSPASS, a trusted traveler program designed to integrate with Canadian and European programs, at JFK and Newark Airports. INSPASS operated with a similar system, identifying travelers with their handprint. The program was discontinued in 2002 when the INS was merged with U.S. Customs to form U.S. Customs and Border Protection. The Global Entry program was initially deployed at a small number of airports, including New York-JFK (Terminal 4), Washington-Dulles and Houston-Intercontinental. Following a good reception by travelers, the program was expanded to include Los Angeles International, Atlanta-Hartsfield, Chicago-O'Hare and Miami International Airport. In May 2009, Global Entry membership was expanded to include Netherlands citizens who are also members of the Dutch Privium trusted traveler program under the FLUX (Fast Low-risk Universal Crossing) alliance. Present members of Global Entry are now permitted to apply to join the Privium program at Amsterdam-Schiphol International Airport allowing entry into the Schengen area. Members of NEXUS and SENTRI are also entitled to use Global Entry. The * indicates there are no enrollment centers at these sites. The Australian and New Zealand SmartGate system is available to all holders of biometric passports of Australia and selected other countries aged 16 or over. Citizens of Switzerland over 16 years of age can use SmartGate facilities at 8 Australian Airports. It requires no pre-registration and is similar to its US counterpart, although in addition, it uses facial recognition technology to process passengers. Germany's federal police also offers Easypass automated border control at major airports (Hamburg, Dusseldorf, Frankfurt, and Munich). It is open to citizens of the European Union, citizens of the European Economic Area, Switzerland, and South Korea. Nationals of the USA and the Hong Kong S.A.R. of China may also register. In Hong Kong, the e-Channel is situated at all border crossing points. A person who holds a Hong Kong Identity Card (HKID) inserts the card into a slot to enter the first gate and then has their thumbprint scanned to pass through the second gate. The Japanese equivalent to the US program, Automated gate, cost is 2200 JPY in the form of revenue stamps. It is similar in that a passport and fingerprint are scanned at a kiosk to pass. Mexico's Viajero Confiable program is open to Mexican citizens and US citizens who are members of Global Entry and are permanent residents of Mexico . Prospective members must pass a background check, interview with a Mexican immigration officer, and have fingerprints and iris scans taken. Kiosks are currently available at the Cancun, Los Cabos, and Mexico City international airports, but the Mexican government hopes to expand it to other cities in the near future. Taiwan's e-Gate is a free automated entry system for citizens and certain classes of residents and frequent visitors. Users simply scan their travel documents at the gate and are passed through for facial recognition. Electronic fingerprinting is used when facial recognition fails. Registration is available at the immigration counter right at the port of entry. In South Korea, Smart Entry Service is the automated immigration clearance system. South Korean citizens aged 7 or above, all foreigners residing in South Korea aged 17 or above, US citizens aged 17 or above who are not residing in South Korea and participating in Global Entry, and Hong Kong and Macau electronic passport holders aged 17 or above are eligible for the program. South Korean citizens who registered their fingerprints are exempted from pre-registration. US dual citizens holding South Korean citizenship must use their South Korean passports to use the programme. US citizens with a valid South Korean visa must use their Alien Registration Card to participate in the programme and are exempted from the Global Entry prerequisite. It uses both facial recognition and fingerprinting technology. ^ a b "Taiwan joins US Global Entry travel program". AIT. ^ a b "CBP Announces Reciprocal Arrangement with Germany for Trusted Traveler Programs". U.S. Customs and Border Protection. December 29, 2014. ^ Hamm, Catharine M. (May 29, 2013). "Almost a 'Trusted Traveler': Are the airport hassles behind her now?l". Los Angeles Times. Retrieved February 2, 2016. ^ a b "How to Apply for Global Entry". U.S. Customs and Border Protection. Retrieved December 3, 2015. ^ "Global Entry Frequently Asked Questions". GlobalEntry.gov. ^ "How to Use the Kiosk". CBP. Archived from the original on June 25, 2009. ^ "Global Entry Card". US Customs and Border Protection. Retrieved August 26, 2018. ^ "Eligibility for Global Entry". U.S. Customs and Border Protection. ^ "Paso a paso: cómo funciona el sistema Global Entry para ingresar a los Estados Unidos". Retrieved August 4, 2016. ^ "Expedited entry into US for Indian travellers from now on - Times of India". The Times of India. Retrieved June 28, 2017. ^ "Faster immigration clearance for eligible Singaporeans travelling to US". www.channelnewsasia.com. Retrieved July 6, 2016. ^ "Global Entry Program: 10 steps to accessing the U.S. Global Entry Program". Retrieved March 26, 2017. ^ "CBP Announces the Expansion of Global Entry to UK Citizens". U.S. Customs and Border Protection. November 3, 2015. ^ Stellin, Stella (October 8, 2012). "Frustrating Hurdle at Customs". The New York Times. ^ Kugel, Seth (April 24, 2014). "Global Entry and Company: Worth the Price?". The New York Times. ^ "Airports with Global Entry Kiosks". U.S. Customs and Border Protection. ^ "Automated border control for travel between South Korea and Germany". bmi.bund.de. 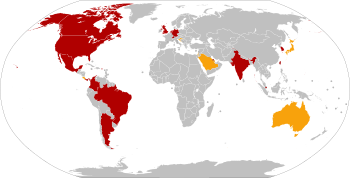 ^ "Which nationalities can use EasyPASS?". easypass.de. ^ "Viajero Confiable Locations". GOB.mx. ^ "Smart Entry Service". ses.go.kr. Wikivoyage has a travel guide for Global Entry.